Part 1: Last week I went for my weekly practice session with a friend, Jim, who had just picked up a new Para LDA single stack. The indoor range where we were shooting has rental guns and a couple of those are LDA “hi-cap” models, so I rented one of these to add a bit more fun to our play. 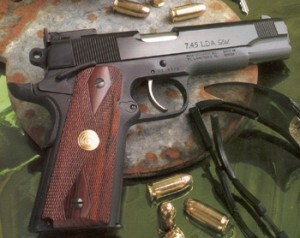 I also brought along my Para P14 Limited, a 5″ Kimber Custom and a 4″ Smith 625 revolver in 45 ACP. The P14 Limited is my IPSC match gun even though it is mostly stock though it has received a trigger job and a tungsten guide rod. The Kimber and Smith are both completely stock. Right out of the box the single stack LDA would not run with three or four jams in the first three magazines we tried to feed it. The owner field stripped it and oiled it up, after which it ran perfectly for the rest of this session. The rental gun did no better when I took it to the line. The problem with the rental was that it was just plan dirt and dry. I took it to the range office where they cleaned and oiled it. After it was returned to me it also ran perfectly for the rest of our practice session. Most of this session is probably not worth reporting but there are a couple points that the list might find to be of interest. One of the things we did was some groups from the bench with all the 45s we had with us. The smallest groups were done with the revolver, with the Kimber coming in a close second. All three Paras ended up in what amounted to a tie for third though my P14 shot a group that was a touch larger. I should point out that the difference in the size of the groups for the 625 and my Para was well less then 1 inch. Of more importance to both my friend and my self was how the guns grouped when shot unsupported. Unsupported my P14 had the best groups by far with the Kimber second and the two LDAs closely bunched right behind it. The results with the Smith 625 were mixed; my friend had groups that were well off the pace of the autos while my groups were about the same as the two LDAs. When I look back at how the guns (and shooters) did in the unsupported testing I don’t see anything that would surprise any one, because it would seem that the performance difference we saw was mainly due to the trigger pull the shooter had to deal with when working with these guns. That is, the lighter and smoother the trigger the better the groups were. My P14 has a very clean 2 lb pull trigger; the Kimber is a fairly clean but stock trigger that runs about 4 1/2 lb. The LDAs trigger are quit clean for a factory DA trigger and only about 5 1/2 lb while my Smith has only a fairly clean trigger that runs right at 11 lb. Part 2: This week Jim let me borrow his single stack LDA while he was out of town. After our session last week Jim cleaned and oiled the gun and carried the LDA as his CCW for the week until I put him on the plane the night before my weekly practice session. Because the security company I work for is considering putting the LDA on the approved for duty use list I took this opportunity to see how the LDA would fair as a duty gun and to see how it stacked up against my present duty gun the 4″ Smith 625. I also brought along my 5″ Kimber to serve as a benchmark. When I received the gun from Jim the only thing I did was unload it so as not to shoot up his carry loads. For my testing I used Shooting Star 8 round and Wilson 8 and 10 round mags. The gun had no problems from any of these magazines. That is not to say the gun didn’t have some problems, rather that the problems it did have were not magazine related. More on this in a bit. For ammo I used factory American Eagle for most of the session though I did run 20 rounds of Federal HS 230 through the LDA to see how it would handle the hollow point that we use at work in 45s. While the gun did run cleanly for the session after my initial problems I think I would still polish the feed ramp and roof of the chamber if it were my gun because with the HS the gun felt like the slide was dragging just a bit as it fed the round. I don’t think it was a question of the gun getting dirty because the Kimber was not doing this and it had the same number of rounds through it sense it had been cleaned and when I went back to ball the LDA lost this feeling of wanting to choke. I think the problem with this LDA is that it has a slightly rough feed ramp; in fact one can easily see that it is not as smooth as it could be. Other then that I was very impressed with the LDA. When I did the state security guard qualification drill with the LDA I almost beat my score with the Kimber, the gun I’ve always done the best with on this drill, and I easily beat my score with the Smith. When I did 15′ Bill drills (6 rounds as fast as possible) the LDA had the best groups of the 3 guns I was working with, but the surprising thing to me was that my times with the LDA were only about .1 slower then the what I did with the Smith and well ahead of my times with the Kimber. Revolvers, for me, are normally a good deal faster in Bill drills then autos and to have an auto come that close was…well, surprising! Why the LDA was giving me better times then the Kimber was a puzzle until I found out that Jim is running a 16 lb recoil spring in this gun while I’m using a 18 in the Kimber. I think what is happening is that the gun is being rocked less under recoil with the lighter spring just as the revolver doesn’t get moved as much because it has no slide. I’ll have to do some testing with light recoil springs to see if this idea is valid though. I also did some other work with the 3 guns but I won’t go into those drills other then to say that when it was all done I was impressed with the LDA. At the start to my second session with the LDA I had some feeding problems, and the problems were lubrication related. When I started my first string with the LDA the gun jammed after the first round. I cleared the problem and tried the two round string again and once again the gun jammed after the first round. I took the slide off at this point and found the rails to be extremely dry, I greased the slide rails and put the gun back together and it ran perfectly after that. I knew that Jim had cleaned and lubricated the gun after our last session. So where had the lube had gone? When I talked with him on the phone that night I found out that he had used oil on the slide rails and that he had carried the gun every day at work for the rest of the week. It would appear that with the mussel pointed down all week the oil drained out of the slide area causing the gun to be dry and this caused the slide to run slow. I had a similar problem several years ago with a 1911 that convinced me to start using grease on the rails instead of oil. Though I think most any gun or light grease would work well but I use Tetra and have been more then pleased with it sense my switch to it in 96. Both my Para P14 and Kimbers have never had a round fired with out this grease and after many rounds the slides moves so smoothly on the rails one would think that a smith had worked over the guns yet these guns are stock. Not to long ago I was ask by a friend if I would recommend the LDA for use as a CCW tool, shortly after that the company firearms director ask me if I though the LDA would be suitable for duty use. At the time I had some experience with the models but I had not really looked at them for these roles because I was satisfied with my present tools, the Kimbers for CCW and the 625 Smith for duty, for these roles. But after these two practice sessions I can see that the LDA could do very well in both roles. Enough so that if and when the company puts the LDA on the allowed for duty use list I’m going be first in line to get one.